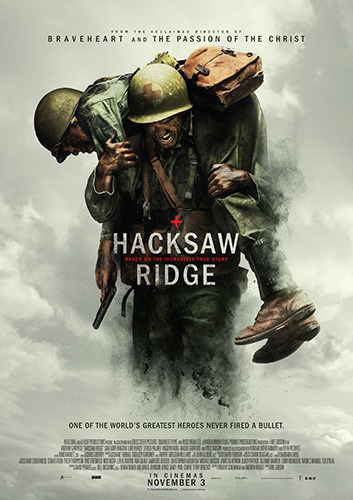 'Hacksaw Ridge' was shot in various locations across New South Wales in 2015 and tells the extraordinary true story of Desmond Doss (Andrew Garfield, 'The Amazing Spider-Man', 'The Social Network', '99 Homes') who, in Okinawa during the bloodiest battle of WWII, saved 75 men without firing or carrying a gun. He was the only American soldier in WWII to fight on the front lines without a weapon, as he believed that while the war was justified, killing was nevertheless wrong. As an army medic, he single-handedly rescued the wounded from behind enemy lines, braved fire while tending to soldiers and was injured by a grenade and hit by snipers. Doss was the first conscientious objector awarded the Congressional Medal of Honour, which is the highest military honour in the U.S., awarded for personal acts of valour above and beyond the call of duty. The film also stars Vince Vaughn ('Wedding Crashers', 'Into The Wild'), along with Australian actors Sam Worthington ('Avatar', 'Everest'), Luke Bracey ('Home & Away', 'The Best of Me', 'Point Break'), Ryan Corr ('The Water Diviner', 'Holding The Man', TV’s 'Packed To The Rafters'), Teresa Palmer ('Warm Bodies') and Academy Award nominee Rachel Griffiths (TV’s 'Brothers & Sisters', 'Six Feet Under', 'Hilary and Jackie'). The 'Hacksaw Ridge' competition has now closed. Winners will be announced shortly. Competition opens at 5pm AEDT on Wednesday 26th October 2016 and closes at 11:59pm AEDT on Wednesday 2nd November 2016. Five winners will be chosen at random on Thursday 3rd November 2016. To successfully win, entrants must fulfil the above entry conditions before the time the competition closes. Current members/followers are eligible to enter the competition. Only one entry per person. Only one winner per household. To be a valid winner, the entrant must not have won a prize from SWITCH within the last 28 days. Each winner will receive one double pass to 'Hacksaw Ridge'. By entering, you agree to receive occasional emails from SWITCH in the future. If you decide to unsubscribe from these updates, any further entries will not be applicable. Only Australian residents are eligible to enter. 'Hacksaw Ridge' is in cinemas from Thursday the 3rd November 2016 through Icon.